Henry Jacob Braunig, Hallettsville, Texas Photographer. Some people just use an old shoebox, while others use store-bought albums, but no matter how we choose to save them, old photographs are sure to provide precious memories of the past. And we are indeed fortunate that there have always been individuals who have dedicated their lives to recording our history through the art of photography. Today, as in yesteryear, professional photographers can be found in nearly every town – large or small. Many years ago, Hallettsville had one of the best of these image-makers. His name was Henry Jacob Braunig. Braunig was born April 1, 1861, on a farm near Old Meyersville in DeWitt County. His mother and father came to Texas in the 1840s. When he was 2 years old, his father was killed in the Civil War. His mother remarried a man named Nau and young Braunig was raised and went to school in Yorktown. He was in school there for about seven years – according to Braunig, that was all the education being offered at the time. At the age of 14, young Henry Braunig became restless and decided it was time to leave the farm and seek a new life. “In 1875 I left home on horseback to make my way in the world, Cuero, Texas, was my destination,” he wrote. His first job was with Graves Brothers Drygoods Co. – although he made good money at that job Braunig was not happy with his living conditions and decided to move on. He was working as a clerk in Cuero when he met Pius Fey, the man who would become his future partner. Fey was a traveling photographer who made his headquarters in Cuero. Braunig was not in good health when he met Fey and the photographer suggested that he accompany him, as his assistant, on his next trip to the mountains in the spring of 1875. “My acceptance led to an almost lifelong partnership, for it continued from 1878 to 1909 – 31 years – and today we are as good friends as were ever called by that name,” wrote Braunig. The new partnership operated under the name of Fey & Braunig and together the two men formed one of the most respected photography businesses in Texas. Fey operated a studio in Cuero while Braunig was located in ../TOWNS/Hallettsville/Hallettsville.htm. In 1888 Braunig built a new home and married Mary A. Lindenberg. They raised five children here and were together until her death in 1912. After the passing of his “beloved Mary,” he continued to be quite active in community affairs – serving as alderman for eight years and as chief of the local fire department for nearly a quarter of a century. One of his fondest memories was that of having been elected as president of the State Fireman’s Association. In 1895 the photography firm of Fey & Braunig designed and built this building specifically for use as a photography studio. The studio was on the second floor, with a stationery and bookstore downstairs. Today the building is home to Hallettsville Florist and Gifts. In 1895 Fey and Braunig built a new two-story building designed especially for use as a photography studio with the upper floor having large windows and skylights to take advantage of natural light. The partners operated a stationery and bookstore downstairs. By all accounts this was the first building west of the Mississippi that was built purposely for use as a photography studio. 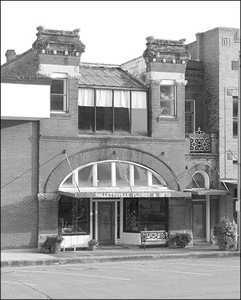 That unique building, standing on the south side of the square, is still in use today and is home to Hallettsville Florist and Gifts. The affiliation of Fey and Braunig lasted for some 31 years and even after they ended the partnership in 1909, the two men continued to be the best of friends. According to many, Henry Braunig was an outstanding photographer of his era. He used an Emil Busch, 8x10 lens for all his portraits. That specific lens was one of the best available at the time. In the years 1913 and 1914 he served as president of the Texas Professional Photographers Association. He also trained others who would go on to become highly-respected photographers, including Dr. John Matthias Kuehne, longtime Professor of Physics at the University of Texas. In 1940 Braunig planned to retire but with America on the brink of war, many new military enlistees and their families began to come to him for portraits. He put off retirement saying, “How could I retire now, who would take these boy’s pictures?” Sadly, after putting off retirement to serve others, Braunig’s studio was a victim of the 1940 flood and many of his photographic plates, dating from the beginning of his career, were destroyed. Some 13 years later, in January 1958, The Lavaca County Tribune ran a small article about Braunig. It stated, “All of the negatives that Mr. Henry J. Braunig had at the time of his death are being displayed on a counter at the Hallettsville Hardware Company. If you find negatives of favorite loved ones you may take it home free of any charge whatsoever as a courtesy of Thomas Keith Hill who bought the equipment of Mr. Braunig thinking he would continue the business.” The story indicated that there were thousands of negatives on display. Chances are that many families in this area have old pictures in their possession with the name “Fey & Braunig” imprinted on them – if you have one of these, take into account the love and dedication that went into the creation of that image.